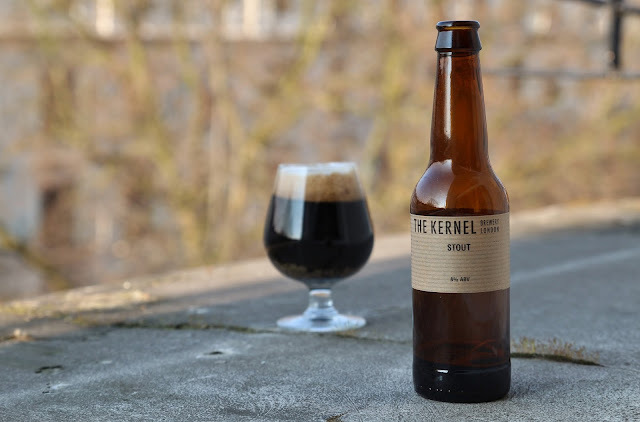 Today we try one of Kernel's stouts. This version is "a blend of two different stouts one of which was dry hopped" and has an ABV of 8%, which places it pretty close to 'imperial stout' territory, at least in my estimation. I'm a huge fan of Kernel's stouts, whatever the ABV. While the brewery garners a significant amount of praise for their hoppy offerings - and deservedly - their dark stuff is, in many cases, just as good. The Export Stout London 1890, for example, is the highest-rated beer in its category ('Foreign Stout') on ratebeer.com. That's a huge accomplishment - the category includes a universe of more than 700 beers, according to RateBeer. With that digression behind us, on to the beer at hand. Of note, it was bottled in October of 2015, so has presumably had enough time to coalesce. This one pours deep brown, with a rich and lasting beige cream head. The aroma gives away a lot of dark chocolate, ashy roast and burnt coffee. The flavour follows wonderfully, with a hard-edged roasted malt character that I consider one of the hallmarks of Kernel's darker output. Again, we get a lot of dark and bittersweet cocoa, rich coffee, some scorched earth, and a moderate punch of alcohol. The beer is full bodied and somewhat chewy, with a delicate level of carbonation that lends the beer a velvety texture. The finish includes further bittersweet chocolate, earth, some woody dryness, very slight hints of oily pine, burnt sugars and an enveloping alcohol warmth. Overall, it's a classic Kernel stout: robust, richly layered and hugely drinkable.